Last Saturday the rhubarb was under 6 ins snow. 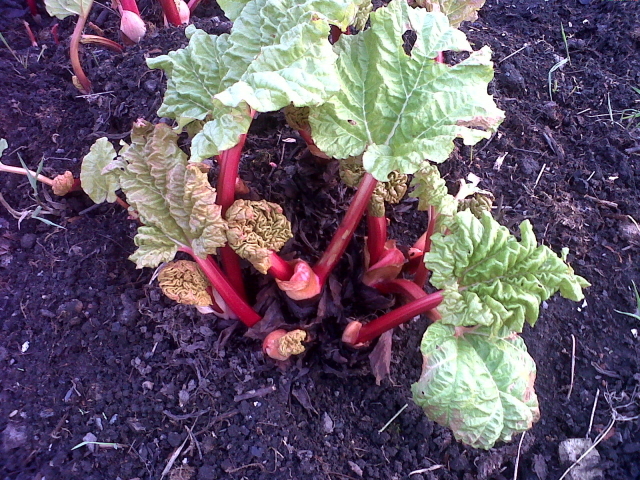 Now the sun is shining and it's relatively warm (10 deg C) and the rhubarb is sprouting beautifully. I really don't see the point in forcing rhubarb when it comes up quite deliciously without any attention (except a bit of compost from our huge heaps). 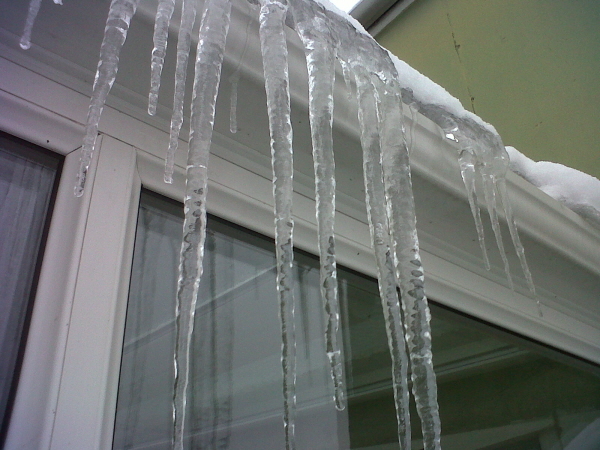 Maybe some rhubarb and custard at the weekend! Rhubarb sprouting colourfully after the snow. Did the annual RSPB Birdwatch on Sunday between 1.30 and 2.30 in the afternoon. 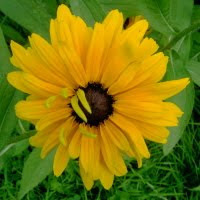 The idea is to count the maximum number of any bird species seen in the garden at any time. So although I saw a male blackbird then later on a female, because they were on their own each time that counts as one. I have no idea how the RSPB use these results to assess which bird species are booming or failing. Wonderful thing stats. Anyway we'll be looking out for the national and Leicestershire results soon. 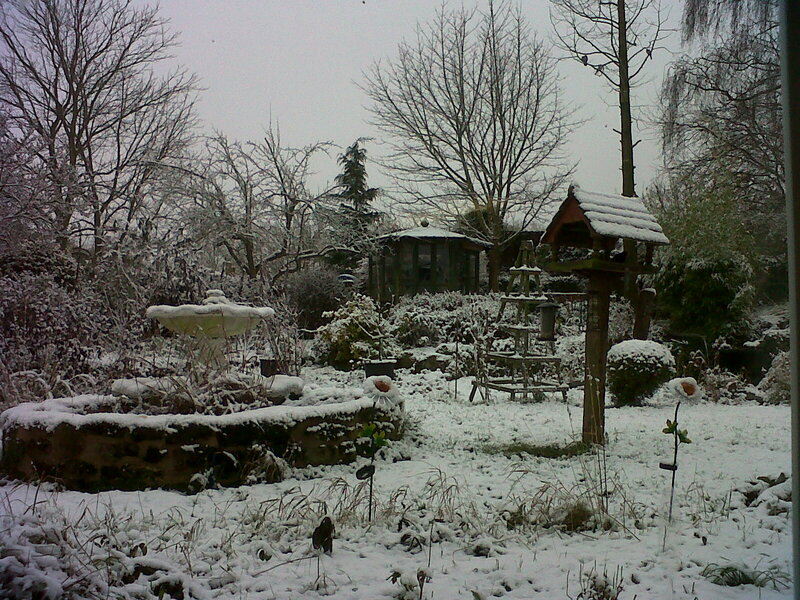 For the first time for over 2 weeks I've woken up and the garden is not covered in snow. The grass is green and the snowdrops are just beginning to push up through. There's not a lot of colour - a few primroses and helibores - but lots of daffodil and other bulb leaves showing and buds are swelling on the shrubs and trees. There are catkins on the hazel tree. When the weather started to get really cold I spread sacking over the rhubarb plants and yesterday still with 3 ins snow on the ground I uncovered them. Today the red stems and yellow/green leaves are looking perky and bright in the sunshine. 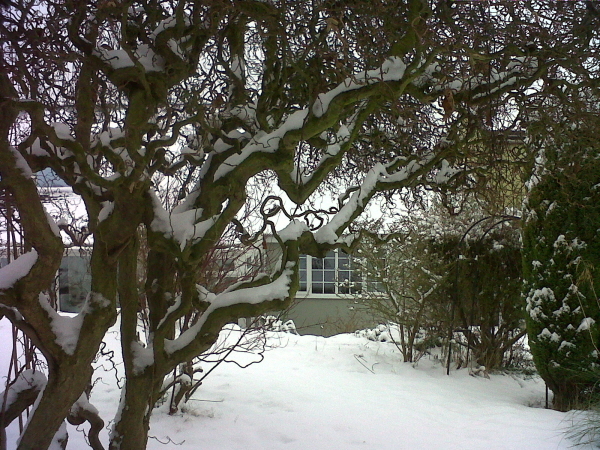 Snow on the contorted hazel creates dramatic shapes. View through the "Mediterranean Garden" which in summer is blue with lavender. 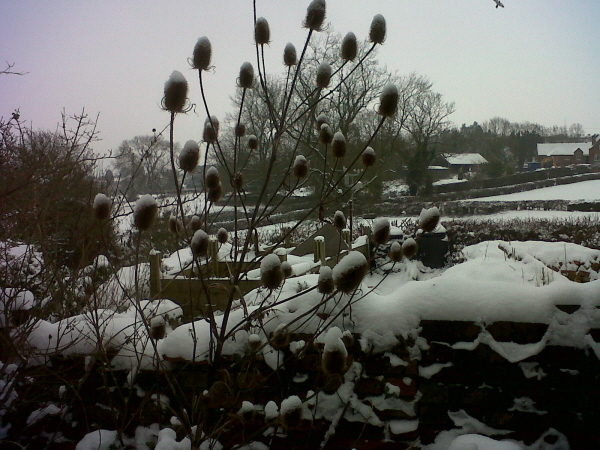 Snow-capped teasels and a view over the field to The School House. 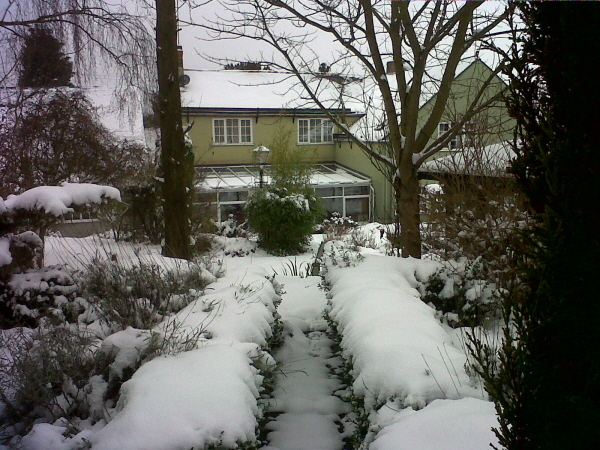 Looking out from our warm kitchen at our snow and frost-covered garden! It was -7 deg C last night and hasn't climbed above zero today despite a bit of hazy sun. Look at the poor birds huddled in the redwood tree. Four grey squirrels have been treating us to a fine display of acrobatics and fun. I know they are supposed to be pests but they are very entertaining. They chase each other around the bird-table, the rose frame, summer house roof and the dead redwood. They sit on the stubby, broken branches in typical squirrel pose, tail erect and curled up over their backs. Last year there were 3 babies - 2 quite big and the other smaller with a thin tail. Looks like the family are doing well! 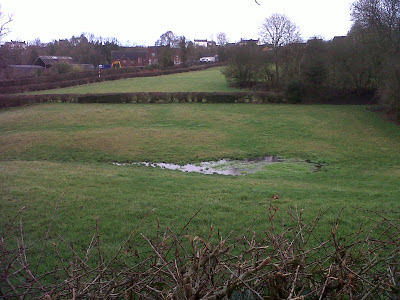 It's official - 2012 was the wettest year for England since records began. The previous owners of Froggarts Cottage built a system of "French drains" in the orchard and vegetable garden and channeled the water through a pipe into a series of water features - the fern garden, then through a pebble fountain and stream at the top of the rockery and over a slate waterfall into the pond. 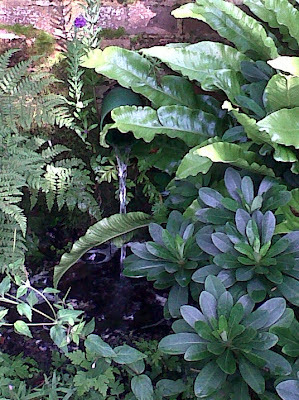 From there the overflow goes into a soak-away and drains.But there's so much water now the system is overflowing and the plants in the fern garden and the lawn are waterlogged. 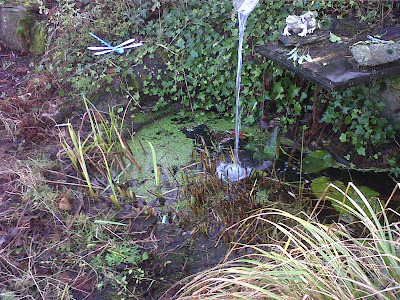 As an emergency measure we have diverted the water straight from the drainage pipe along a length of guttering straight to the pond. The result is continual sound of pouring water - but the lawn and fern garden are a bit more healthy. The last few days have been sunny and warm and we're promised a good dry weekend so I'm looking forward to getting out there and getting rid of wet leaves lying on the garden and trimming back some of the more unruly bushes.